Pioneering Ultrabooks need pioneering keyboards - and the ThinkPad Yoga 260's innovative lift-and-lock keyboard fits the bill. The new standard for PC performance has arrived with Intel 6th Gen Core processors. This blazing fast, feature-packed processor family with built-in security is ready to take your productivity, creativity, and 3D gaming to the next level. What's more, by enabling the exciting Windows 10 features, 6th Gen Intel Core processors empower you to unleash your imagination and explore the possibilities. Windows 10 is the best combination of the Windows you already know, plus lots of great improvements you'll love. Technologies like InstantGo let you boot up and resume quickly, everything runs fast and smooth, and Windows 10 devices now have Battery Saver to automatically conserve power - so you can work longer and play harder. For total confidence, Windows 10 helps you stay up to date and has more built-in security features than ever for helping protect against malicious software. Easily change between four modes - Laptop, Stand, Tablet, and Tent - while your system automatically switches system settings and locks the keyboard in place. 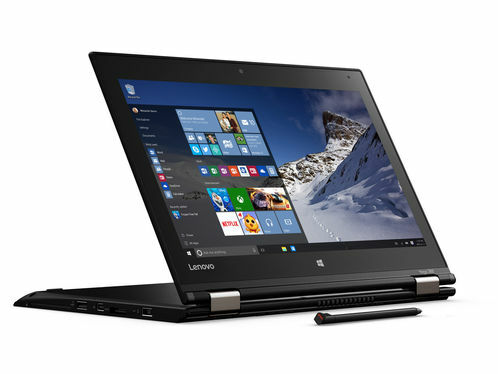 The secret: ThinkPad Yoga 260's unique design, improved hinge, and touchscreen display allow the screen to flip around 360 degrees - and even lay flat - which means you can select the mode you use based on what you choose to do. Starting at a mere 1.3kg (2.9 lbs) and just 17.8mm (0.7) thick, ThinkPad Yoga 260 is ultraportable - it's perfect for productivity on the go. And with up to 10 hours of battery life, you can go all day without recharging.